A seminar on ‘Organic Farming’ was organized at the SHARANAM Campus of Sri Aurobindo Society, Ousteri, Puducherry on February 22, 2018. 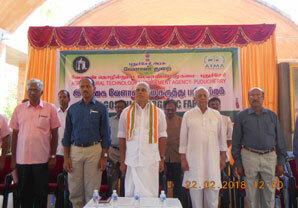 The event was jointly organized by Agriculture Technology Management Agency, Department of Agriculture, Government of Puducherry and the Rural Development Wing of the Sri Aurobindo Society. Hon’ble Agriculture Minister Thiru R. Kamalakkannan, chief guest at the event, inaugurated the programme and addressed the farmers who had assembled from various regions of Puducherry state. 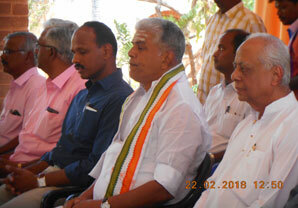 Among other dignitaries were Development Commissioner and Secretary Thiru. Anbuarasu, IAS, and Shri. Vijay K. Poddar (Member Executive – Sri Aurobindo Society). 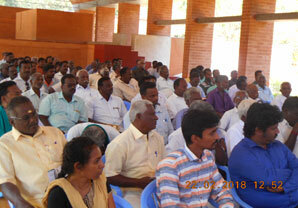 More than 80 farmers from Puducherry and 30 farmers from Karaikal attended the program. Traders, field experts, successful experienced organic farmers were also invited to the event to share their valuable ideas and innovations related to organic farming. The Sustainable Livelihood Institute – Auroville, ICON – Organic Product Certification Agency, IIT-Chennai, Space Marketing Agency were among the esteemed organizations which were present at this first-of-its-kind event, aimed at bringing together stakeholders in the field of organic farming. the Minister said that agriculture without cow is not agriculture and urged farmers to have cows. Speaking to the farmers, Vijay K Poddar called for active participation between the farmers, the government, corporates and international agencies. He also made reference to making new inroads into agricultural development to mark the 75th Independence Day in August 2022, coinciding with 150th Birth Anniversary of Indian philosopher Sri Aurobindo, and invited the stakeholders to work towards a Golden Puducherry. The Minister also praised the continuous dedicated efforts of the Agriculture Department in Research, imparting training to farmers. “The seed of Organic Farming has started to bloom across, Puducherry and this gathering would prove to be a blessing for Organic farming,” he said. He also urged the officials to document such events through video and image formats and make it available to other key agricultural organizations in order to reach more farmers. Such events will change the perception of traditional farmers regarding organic farming and build their confidence. Referring to the Centre’s plan to double the farmers’ income by 2022, Minister Kamalakkannan said that organic farming would soon not only be a realist but the ‘optimal’ way to increase a farmer’s income. The Minister also mentioned the recent Agriculture Department’s memorandum of understanding with the Hyderabad-based International Crops Research Institute for the Semi-Arid Tropics (ICRISAT) to share expertise and enhance agriculture productivity in Puducherry and Karaikal regions. The gathering proved quite productive as it addressed issues such as market space for organic products, grievance redressal agency for organic farmers & traders, fair price mechanism for organic products and common platform between traders and organic farmers.